I don’t often write about specific cocktails unless I’m working on a Mixology Monday post (one coming next week!) or if it’s part of a rum review – and it’s exceedingly rare that I post about a RumDood original cocktail. This week, however, has seen me rather busy with work and preparations for the dizzying month ahead. I’ve got OC Weekly’s “Best of OC Party” in Irvine tonight, Tiki Crawl 8 in San Francisco on Friday, Saturday, and Sunday, MxMo and a review of Old Mill Rum for next week, a wedding, and then I get on a plane and fly to London for UK RumFest. Mix ingredients with ice in shaker and shake until good and frothy. This is a drink that I made somewhat on a whim for a friend. For those of you that don’t know, in addition to writing software, running this blog, and cycling, I manage a local rock band – which is to say I hang out with a group of friends that are immensely talented and introduce myself to people as their manager to see if it will get me free drinks. The lead singer, Jezebel Rose, was at my house one evening and somehow we got to talking about alcohol (crazy, I know). She asked me about my bottle of Castries Peanut Rum Cream and what I could make with it. I know one or two recipes that use it, but at the time lacked some of the key ingredients…so I made something up. After futzing around in the kitchen for a while, I presented Jez (who moonlights as a bartender) with the above drink. She seemed pleased. “It tastes like Halloween.” I don’t know what that means cause I’ve never eaten Halloween – although I have partaken in its candy. I do think – if I may be so bold – that this is a pretty good drink for Fall. 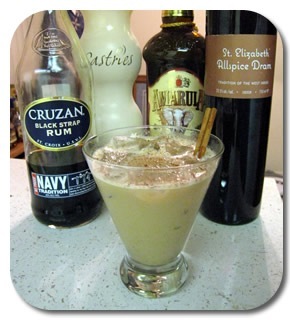 *Note: I had originally made it with crema de nance from Honduras instead of Amarula, but seeing as how nobody else I know owns that particular liqueur, I figured it would be better to post a recipe using a liqueur that someone else might actually have. That sounds, as the kids might say, goddamned delicious. I was very skeptical about Castries Peanut Rum Cream when I first saw it at the New York Bar Show earlier this year, but I was pleasantly surprised after tasting it-great flavor and consistancy. Now I know what to do with it!